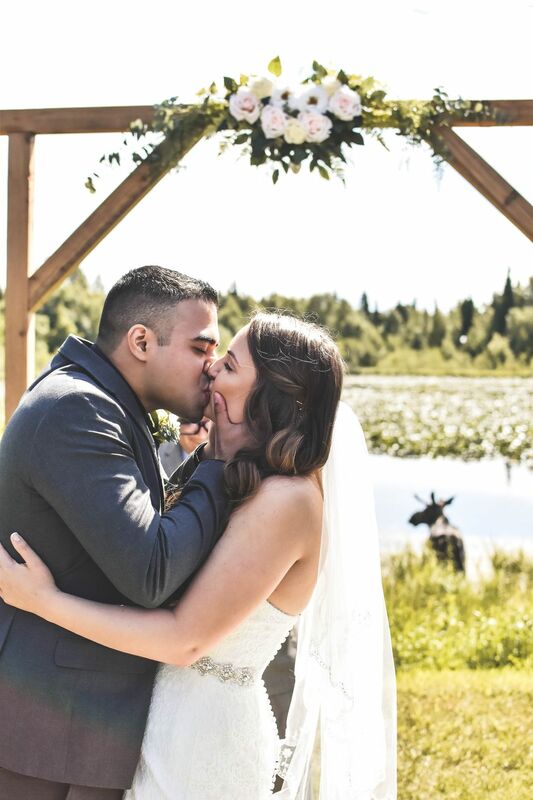 Anchorage high school sweethearts Shandalyn and Alan Cuellar were just about to seal their wedding vows with a kiss Saturday night when an unexpected visitor crashed the ceremony. The two were standing underneath a rustic wooden arch adorned with flowers and ferns on the lawn of the Bayshore Clubhouse in South Anchorage when "I started hearing some rustles behind us in the woods and the trees," said Shandalyn, a 22-year-old dental assistant. Next thing she knew, a moose ambled out of the woods. "The moose started coming right at us," Shandalyn said. Wedding guests gasped. The pastor stopped talking. 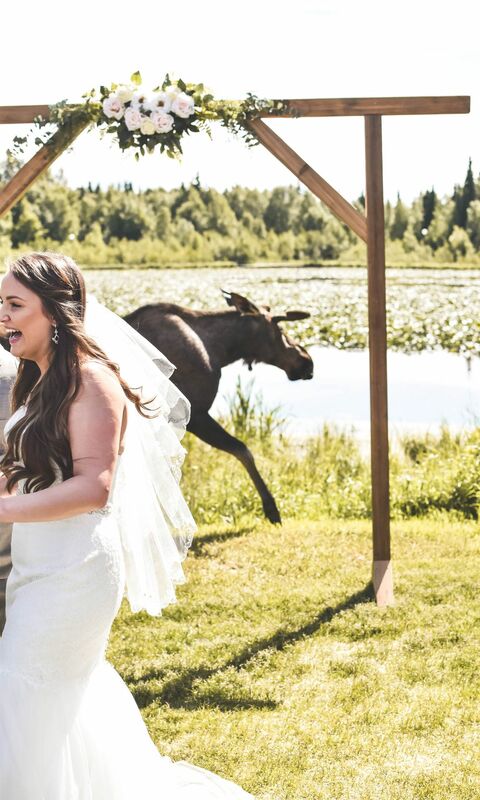 Wedding photographer Bria Celest kept snapping, capturing a surprised-looking Shandalyn and a determined-looking moose clomping down to the lake behind her. Shandalyn said she turned to her maid of honor, visiting from Florida, to shoot her a look that said "here's the moose you wanted to see." After the moose had moved out of range of the bride and groom, the pastor "just reined everyone back in," Shandalyn said. "He said, 'Let's get this done, let's get them married." The ceremony went on. The moose did not budge. He stuck around the lake for the duration of the reception, she said. "That moose is in the background of a lot of our pictures," she said. The wedding day moose was kind of appropriate, she said: The couple met as students at Service High School and have been together for more than seven years. The groom, Alan, 25, is a school bus driver. Both grew up in Anchorage, where moose are likely to show up in places like a grocery store parking lot or a bike trail, or a wedding ceremony.